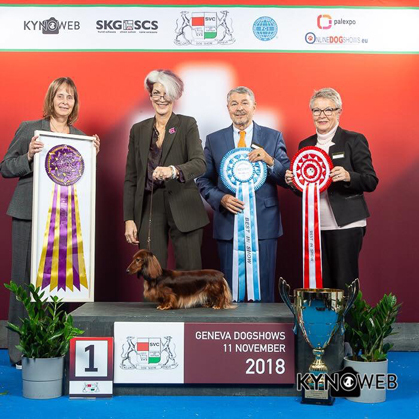 Congratulations to Miniature Longhaired Dachshund, Rodel’s Magic Moonline – “Luna” on garnering Best in Show at the Geneva Dog Show under Judges Nicole Kubli and Kim LeBlanc. Congratulations to Anca Diana Giura, Perttu Stahlberg, and Handler Lisa Croft-Elliott! Posted by chesliepickett on Nov 12 2018. Filed under Featured, World News. You can follow any responses to this entry through the RSS 2.0. Both comments and pings are currently closed.